In the final installment of Use the 9 Box to Develop Talent I address the specific needs of individuals who demonstrate low potential. When it comes to the succession planning process, much of the focus tends to be on high potentials. 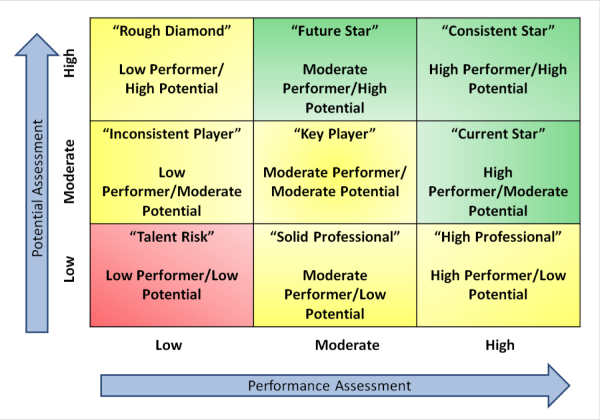 One of the many benefits of using a tool like the 9 box grid to guide our assessment of individuals is that it can then help us to identify the specific types of actions that should be taken to ensure the ongoing development of talent across the organization. The common theme that runs across the three groups of individuals with a low level of potential is a lack of desire to take on more responsibility or develop new skills. In some cases, the organization does not suffer from keeping a low potential employee in a position, in other cases it can be a significant barrier to the development and advancement of others. Deliver strong performance and results as needed in their current role. Are motivated to do what is needed in current job, and aspire to maintain their current role within company. Keep current skills up-to-date, but demonstrate little effort to build new skills. Are primarily focused on technical success. Demonstrate technical, professional, managerial, and leadership skills that are acceptable for current organizational level. Ideally, individuals in the box possess highly specialized skills/experiences that would be difficult to find in the marketplace. However, keeping them in the current role could be blocking career development opportunities for others. Individual development efforts for these individuals should focus on utilizing their knowledge and skills to assist others, reinforcing their value to the company. Develop in place - Offer opportunities for deepening or broadening technical specialization or expanding leadership skills. Place in the role of knowledge/content expert on project teams. Provide opportunities to train others in specialty area. Encourage individuals to publish, present or serve as key note speaker in specific functional areas. Provide regular recognition and praise. Offer direct feedback on opportunities for advancement if asked. Delivers the results and level of performance that are expected of them on a consistent basis. Exhibits little interest in taking on greater responsibilities or higher level roles. Appears marginally interested in learning from experience, or in changing his/her routine. Demonstrates technical, professional, managerial, and leadership skills that are at or somewhat below what is expected for current organizational level. Individual development efforts should be aimed at improving performance in specific areas and re-assessing performance and potential on a regular basis. Focus development on specific competency or skills gaps to move from moderate to high performance. Provide clear feedback on opportunities for advancement. Offer opportunities for enhancing technical or leadership skills that support current role. Monitor regularly to evaluate for performance improvement and re-assess potential. Delivering poor performance/results in the current role. Exhibiting little to no interest in taking on greater responsibilities or higher level roles. Demonstrating in an inability to learn from from experience or changing his/her routine. Avoiding having to change or learn new skills. Displaying technical, professional, managerial, and leadership skills that are clearly below what is expected for current organizational level. When it comes to development, a performance management approach should be taken. It is just as important to target development actions to this group as it is to individuals in the top right box. Clarify performance expectations and focus on performance improvement until performance improves. Be specific on ways that performance must be improved. Provide feedback and monitor regularly to evaluate for performance improvement. Remove from role if performance does not improve in a reasonable amount of time. Identify and remove individuals who are clearly blocking the advancement of high potentials. Share your thoughts and experiences with us. How have you used the 9 box in talent development?